Slave To The Power - "A Tribute To Iron Maiden"
This is quite a cool compilation CD with 20 different bands all covering Iron Maiden songs. Iron Maiden was one of my favourite bands back in the 80s and I am still impressed that they keep it going with high quality stuff. Here you get a mixture of bands that mostly stick to playing pretty close versions to the originals. The best songs on the CD are the ones where the bands step outside and give the songs their own unique twist. Solace, which opens the first CD with "Another Life", from the Killers LP, is brilliant. A great unique groove and feel, yet still Iron Maiden. I am really blown away by the number of singers that can sound exactly like Bruce Dickenson. I mean it is so close you could convince someone it was Bruce (Sebastian Bach, Error 7). Crowbar, perform an excellent and unique version of "Remember Tomorrow". 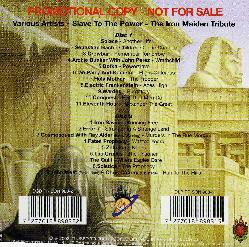 The other memorable song on the first disc is the version of "Powerslave" by Dofka. I was surprised to see Eleventh Hour take on "Alexander the Great". CD2 starts with Iron Savior doing "Running Free". Cosmosquad version of "Murders in the Rue Morque" is a unique take on the song, whether you like it or not! It features Ray Alder from Fates Warning. Las Cruces play a very cool and unique rendition of "the Prisoner". The Swedish band, The Quill, takes on "Where Eagles Dare", and provides an impressive version. Solstice plays a unique version of "The Prophecy" but I did not care for it. The CD ends with "Run to the Hills", by John West and Chris Caffery (Savatage). If you are an Iron Maiden fan with an open mind, then I think you will enjoy this, I sure did. For more information you can visit the People Like You In Prison web site at: http://www.peoplelikeyou.de.